Tired of your browser’s start page? Want something fresh? Like Microsoft’s simple yet stunning Metro design language? Got Firefox or Internet Explorer? If your answer to these questions is a resounding YES, then you need to give Eight a try. 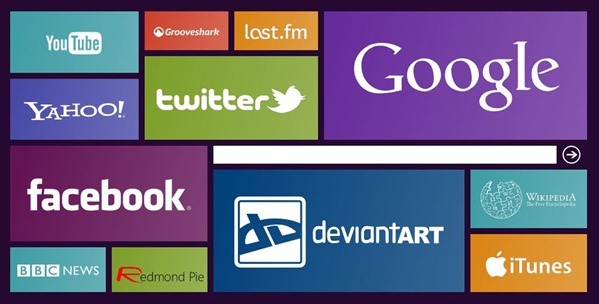 Developed by DeviantArt member “flatmo1”, Eight is a Metro-inspired start page for all major browsers (that’s Chrome, Opera, Firefox and Internet Explorer) except Safari. It is based on HTML/CSS/jQuery and is inspired by Windows 8’s UI. It isn’t a one-step set up, but it’s really nothing difficult. It involves downloading a .zip file (link pasted at the end of the post) to your PC. You then open the index.html file inside the downloaded .zip file with the browser of your choice (ours is Firefox). According to our information, Safari and Firefox are the most used browsers for accessing Redmond Pie. But since Safari isn’t supported by Eight, here’s what Firefox users need to do: Open the Firefox menu (that’s the orange button on the top left) and click on “Options”. Now, under the “General” tab, look at the “Home Page:” option. Click on “Use current page”. Click “OK” at the bottom and you’re done! Eight comes with bookmarks for popular sites like Facebook, Twitter, last.fm, Wikipedia but also comes with bookmarks for less popular sites like iTunes/Grooveshark. Thankfully, you can edit them. This does, however, require some relatively advanced skills. You can edit the source.xml file to replace pre-installed URLs with URLs of your choice. For changing the logo of the website tile, you’ll have to create a .png file of the site’s logo and dump it in the thumbs folder. Lastly, to change background of the tiles, you can mess around in the lib folder. It can take quite a lot of time properly setting it up. But once it is done, the result is nothing short of delicious eye candy.